Gracepoint: An Inexact Copy | Wait! What's A Dial? Dear David Tennant: the next time you’re cast in an American drama series and some network honcho tells you to lose your beautiful Scottish brogue, you fight it. My own biases aside, there’s much to be said about Fox’s new drama Gracepoint. I don’t want to be yet another person stuck in the abysmal “British originals trump American remakes” mindset, nor do I necessarily want to focus on how foreign Tennant’s accent sounds to me, a fan of both his run on Doctor Who and the original Broadchurch, from which Gracepoint is directly influenced. But in its relocation from the English county of Dorset to a northern California town, it seems to have forgotten parts of itself along the way. The pilot episode of Gracepoint is structurally almost identical to its cousin. Young mother Beth Solano (Virginia Kull) wakes up one day to discover her son Danny is mysteriously missing, and makes the usual calls and inquiries into his whereabouts. 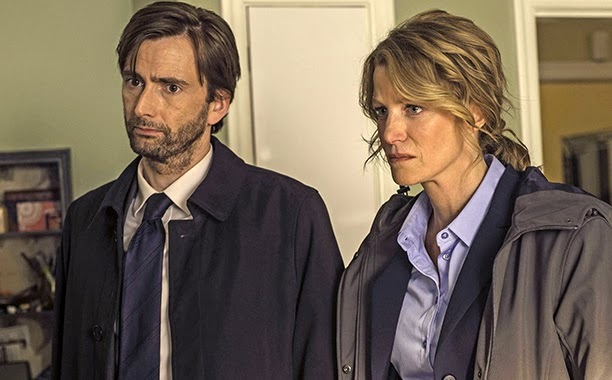 Meanwhile, Detective Ellie Miller (Breaking Bad alum Anna Gunn) returns to work after a vacation to find that the job she was being considered for has been given to Detective Emmett Carver (David Tennant With An American Accent, whoops, there I go. I’m sorry. I’m so, so sorry.). Carver is an out-of-towner hoping to put some demons of an undetermined nature to rest, and Miller is rightly pissed that he’s muscled his way into her limelight. But these characters’ normal lives all come crashing together when Danny Solano’s body turns up on a Gracepoint beach, jump-starting the worst breakdown of “love thy neighbor” in TV history. I don’t have a whole lot of nit-picky complaints. The pilot wasn’t bad, to be sure. In fact, I think the show will do fairly well, especially for American audiences who aren’t used to this kind of serialized police drama. But I did have an issue with the fact that it’s already sacrificing proper introductions for the sake of getting straight down to the murder. This is, without doubt, a character-driven story, and it boggles the mind that Fox would order 10 episodes of this show, two more than Broadchurch, only to skimp on drawing out the suspense and character development. The journalistic aspects of Gracepoint are similarly tossed into the fray without much explanation; the main players have barely changed but I already like them less. It’s all too rushed. It needs more time to simmer. Thankfully, though, the acting is up to par here. Tennant and Gunn are excellent in their respective roles. While this is deja vu for Tennant, Gunn brings an earnestness to Miller that I think will play nicely with Carver’s broody, sometimes volatile behavior. They clash right from the get-go, not just because of the promotion, but because Miller initially doesn’t know how to handle such a terrible crime in the sleepy suburb. Where Carver is damn near emotionless, Miller personally knows the people involved and poses a liability to their privacy as well as the secrecy of the case. The supporting cast also brings their A-game, including Virginia Kull, who has a truly heart-breaking reaction to seeing Danny’s body on the beach, but grieves in a completely different way from her British counterpart, played by Jodie Whittaker. Gracepoint will purportedly feature a different murderer, which is a relief, because then there really wouldn’t be a reason to watch this remake. Bottom line: if you’ve seen Broadchurch, you aren’t missing anything, but if you haven’t seen it, give this show a try. It may lack the spark that made the original so popular across the Pond, but it should still have the power to throw viewers for a loop. Gracepoint airs Thursday at 9 PM on Fox. Ginger-American. Graduate of Rowan University with a BA in Communications. Enjoys writing, reading, and making pop culture references in everyday conversation. Posted on October 6, 2014, in American Television, British Television, Drama, Fox, Network Television, Primetime, Uncategorized and tagged anna gunn, Broadchurch, david tennant, fall tv, fox, gracepoint. Bookmark the permalink. Leave a comment.